Quiet weather through the weekend with highs near 50 at lake level, and 40's on the mountains with light winds. A cold trough will push down from the North next week. This will bring in much colder air with highs only in the 20's on the mountains starting Tuesday through the end of next week. It will also bring more snow for a prolonged period through most of the week. The question is how much snow. Right now several inches seems to be a safe guess, but the potential is there for several feet if everything comes together just right. That being said here is what we are seeing currently for next week. The high pressure ridge off the coast shifts NW out towards 150-160w. That allows a very cold trough to drop down the West Coast. These troughs normally push through a cold front which has a band of precip associated with it, and then open the door to additional waves of precip moving in behind the front. The circulating area of low pressure can steer these waves, and as the core of the cold low moves over the mountains it can create additional precip. These cold troughs and lows pick up moisture off the ocean, so if they move down over water they bring in more precip vs comind down over land. The question for next week has not been the pattern that could bring cold, but how far West the trough would be able to dig and how much moisture it could pick up. The trend starting with the GFS and now the other models has been further West with the center of the circulating low pressure moving down the coastline. That has been trending us towards a snowier scenario. If it trends further East between now and next week then we would be talking much less snowfall, but still a cold Thanksgiving. 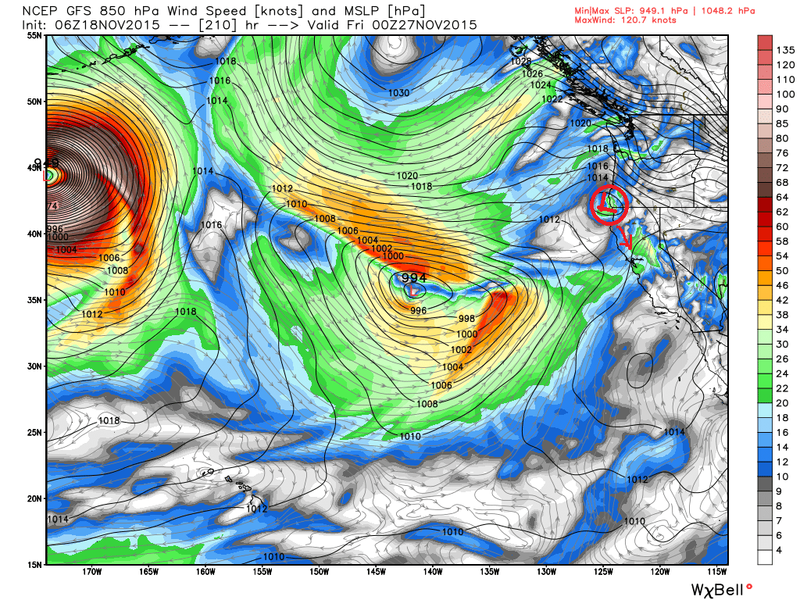 The other thing that is interesting about this low moving down the coast is the speed. 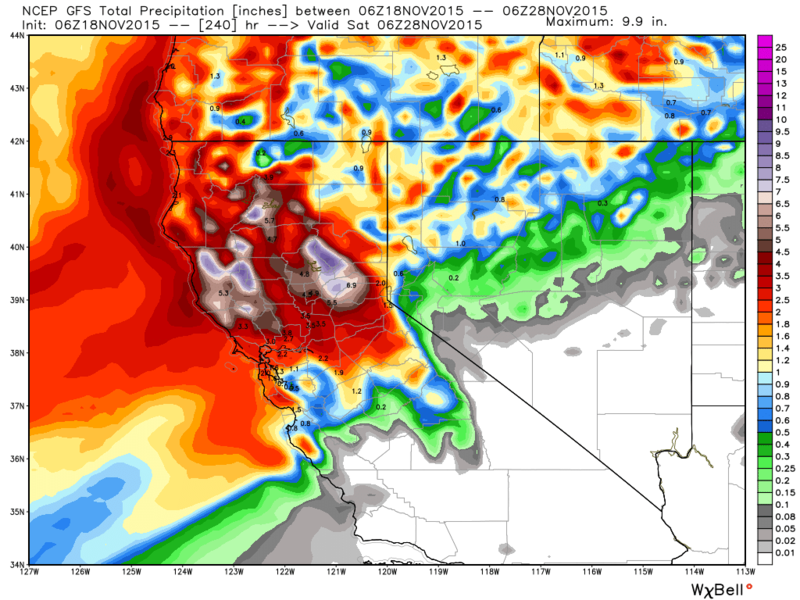 It looks like it will move very slowly down the coast while steering several waves of precip into Northern CA. Here is a shot of the latest GFS model run showing the center of low pressure for Monday night near the U.S. Canadian border. and here is the GFS model for Thursday night next week... 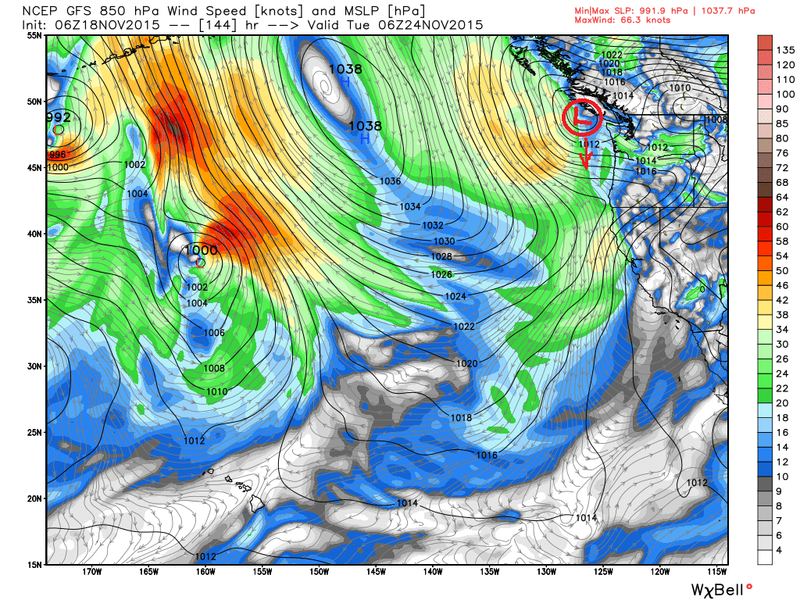 The low over 3 days has moved a very short distance down the coast. That slow movement allows for 3 days of prolonged precip with several waves moving in under the low before the low moves East. There is no subtropical moisture tap or atmospheric river that we normally see for storm that brings large amounts of precip. But the prolonged nature of the storm and if it stays just off the coast tapping Pacific moisture, we can still see quite a bit of precip. Here is the latest GFS forecast total precip through Thanksgiving. Again, we are a bit too far out in the storm window to be getting too excited. If this looks the same by Saturday then we should be a lot more confident. The good news is that the trend is going in the right direction and the forecast models are coming into agreement on the snowier scenario. 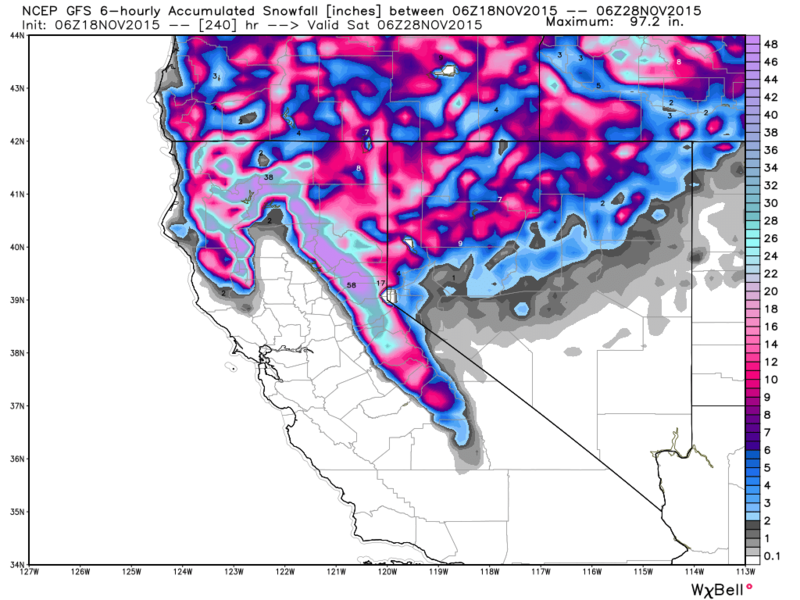 If this does happen the busiest travel day of the year on Wednesday would be a disaster through the Northern Sierra. Just as interesting is the pattern that may follow this for week 2. The ensemble runs are showing high pressure shifting East towards Canada and keeping the storm door open underneath. The operational model runs show a storm moving across the Pacific and reaching CA next weekend on the heels of the departing cold system next week. 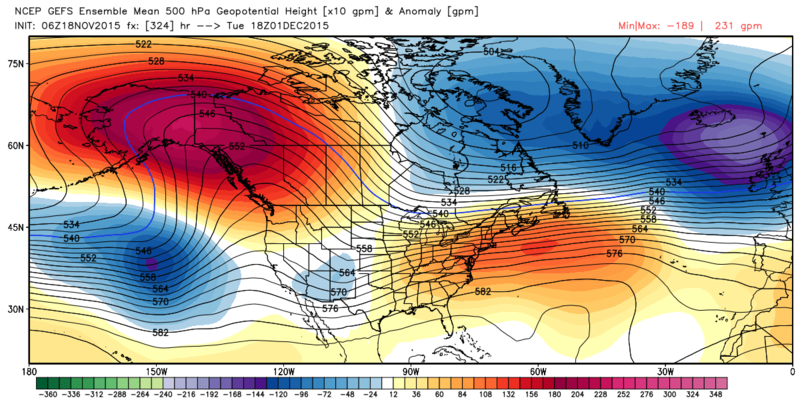 Here is a look at the GFS ensemble forecast for the height pattern on December 1st.